If there’s anything 10-year-old Anjana loves more than going to school and meeting her friends, it’s playing carrom. Once full of life and always on the go, Anjana now even struggles to lift her hand on some days, let alone play her favourite sport. Blood cancer is draining the life out of her. Not only has it destroyed her childhood, but her parents, Kashiraya and Suvarna, now can’t go a single minute without fearing for her life. 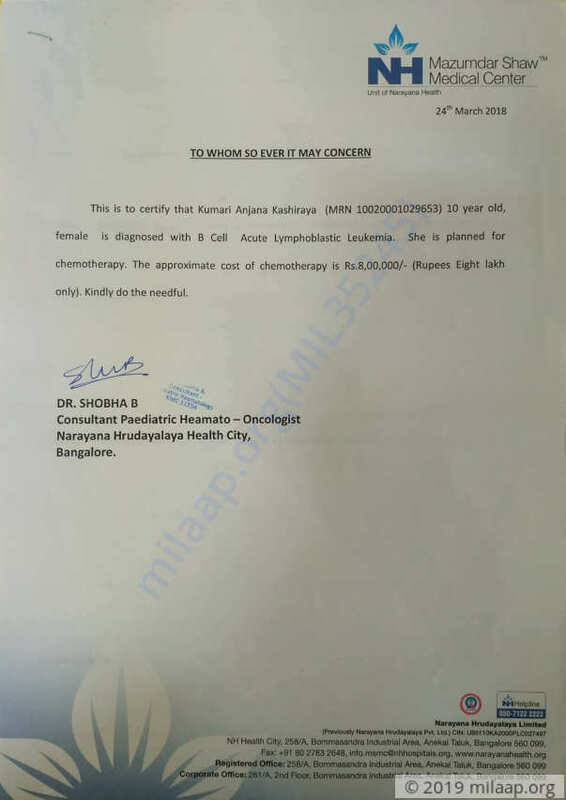 Only chemotherapy can save Anjana. It’s been two months since Kashiraya and Suvarana received the worst news of their lives. Since then, their lives have been consumed by this disease. 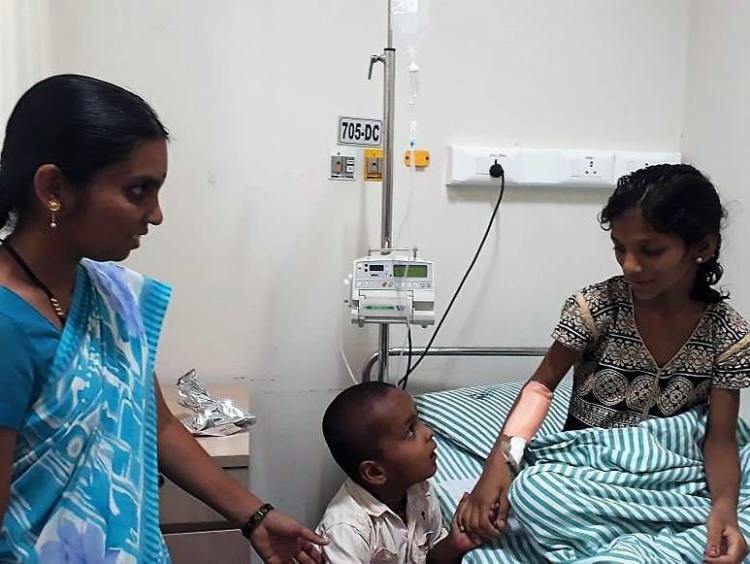 Anjana struggles to even walk on her own, and Kashiraya stands with her as her pillar of strength, making sure to hold her hand through the pain. Anjana has had three cycles of chemotherapy, but her fight is long from being over. She stills needs to continue chemotherapy and medication for long before she can go back to the childhood she once knew. While Kashiraya is relieved to hear about her prognosis, his worries about affording her treatment are only increasing. He is a mathematics teacher in a small school in Bijapur and earns just enough to provide a living for his family of five. Anjana has blood cancer and only chemotherapy can save her from succumbing to this deadly disease. She has already had 3 cycles of chemotherapy and needs to continue treatment to get better. 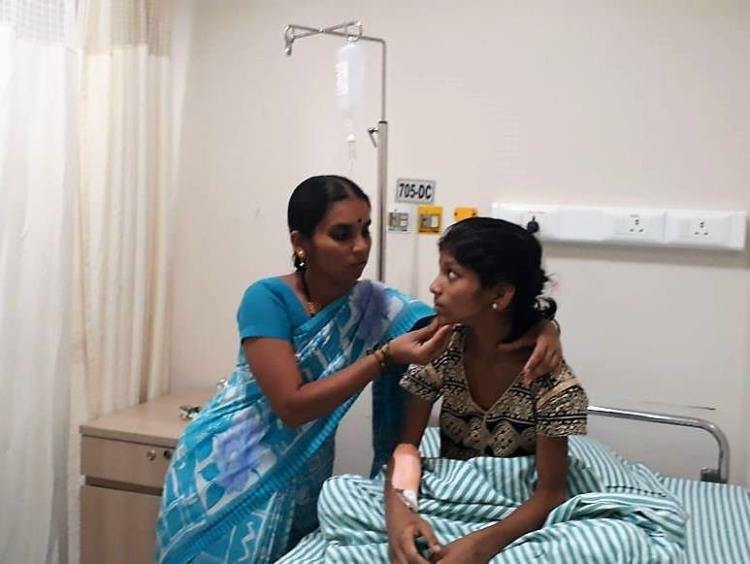 Kashiraya has spent nearly 3 lakhs on her treatment so far and can’t afford the 8 lakhs needed to complete the course of her treatment. His salary of a school teacher isn’t enough to save his daughter. 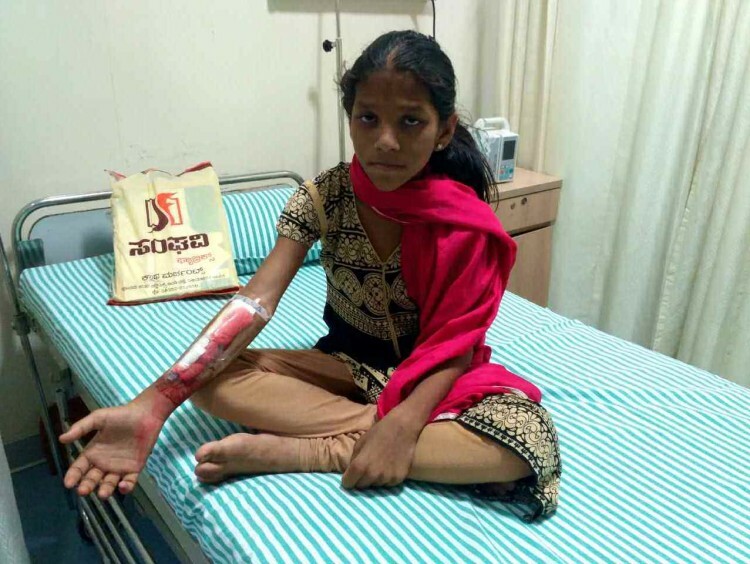 Your support will save Anjana’s life. Click here to save Anjana. We have some unfortunate news to share with all of you. Kumari Anjana Kashiraya is no more with us. 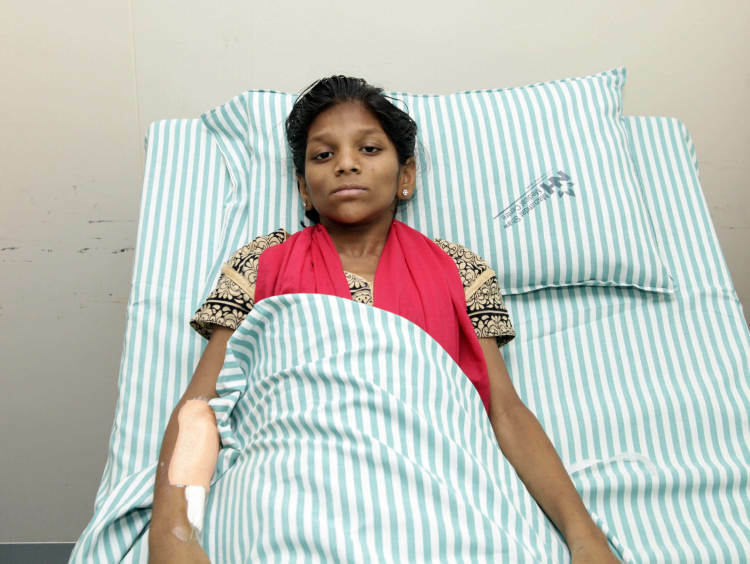 Kumari Anjana Kashiraya was undergoing her treatment but her health deteriorated and she couldn't make it. All the funds raised will be utilized to clear her medical expenses. 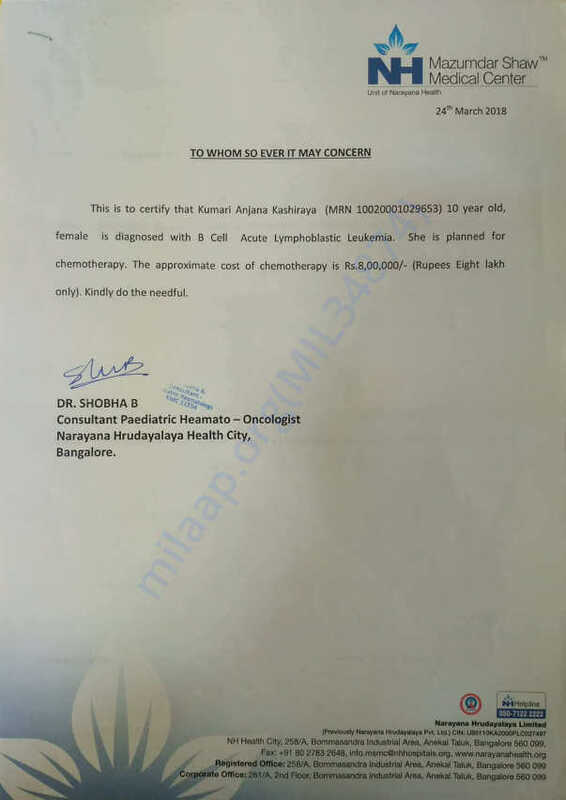 Kumari Anjana is currently in the hospital. She is doing well and is recovering. She underwent 3 cycles of chemotherapy and there were no side effects. She is stable. Thank you for your support. Anjana is doing good and doing well. She has completed 3 sets of chemotherapy and is waiting for a test result to tomorrow. Once the result is up they will come to know whether she should undergo chemotherapy again or else do the transplant.